Petersen Island Woods Preserve is a 40 acre preserve located north of Elkhorn, Wisconsin at Lauderdale Lakes, on a peninsula between Green Lake and Middle Lake. The topography of this Preserve was sculpted by glacial activity, leaving a series of forested kettles. 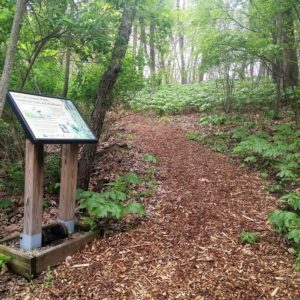 It is owned by Kettle Moraine Land Trust and open to the public for passive recreation such as hiking and nature study. The Lauderdale Lakes Improvement Association donated this property and continues to support this Preserve through significant annual donations to the Kettle Moraine Land Trust Stewardship Reserve. This preserve has a hiking trail with a Leopold bench that overlooks one of the deepest kettles. When walking the trail, please use the boot brush stations located at each entrance to prevent the spread of invasive plants both onto and off of the property. The trail can be accessed from either Oak Park Road or West Shore Drive. Two parking spaces are reserved for trail users in the turnaround area located at the east end of Oak Park Road. During 2016, the Kettle Moraine Land Trust Board honored their founding President, Jerry Petersen, who had served in this role for 15 years by renaming the Land Trust’s first Preserve, Petersen Island Woods Preserve. 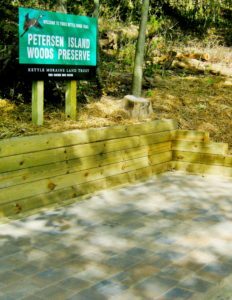 Petersen Island Woods Preserve is located at the east end of Oak Park Rd, Elkhorn, WI 53121.